Fathis Ules is a Dunmer fence based in the Elven Gardens District of the Imperial City. Because of his affiliation with the Thieves Guild, he will only offer you his services once you have been promoted to the rank of Master Thief upon completion of the Arrow of Extrication quest. With 1500 gold Fathis has the most gold of any merchant in the game but due to his mastery of Mercantile, he pushes extremely hard bargains. Being one of the highest ranking operatives in the Imperial City as well as the guild's best fence means Fathis travels around the great city constantly, supposedly to avoid unwanted attention and to seek out potential sellers and new members. True to his profession, he spends most of the night out and only goes to bed at 5am, sleeping in the double bed on the second floor of Dul gro-Shug's House. After waking up at 11am, he sets off for a two-hour brunch at the nearby King and Queen Tavern. Once he's full, he heads for either the Arboretum (on Tirdas and Turdas) or the Market District (all other days), where he will be found wandering around until 5pm; at which point he makes for the Tiber Septim Hotel to enjoy a luxurious dinner. He leaves at 7pm and heads back to the Elven Gardens District, spending all the night until 5am sitting on the chest behind his house. On Sundas, he will visit the Temple of the One between 7pm and 11pm. Once you become the Gray Fox, he will spend his nights at Dareloth's House along with his fellow guildmates. Fathis was also intended to play a role in the unfinished Imperial Couriers quest; at midday on the 18th of each month, as long as Wilbur is still alive, he will head to the Black Horse Courier and stay there for a brief moment before he resumes his usual schedule. The other large exception to this schedule is once you've completed the Legacy Lost quest, at which point Fathis relocates to The Oak and Crosier inn in Chorrol. For the next two days, he will be found wandering around the inn, stopping to eat dinner between 8pm and 11pm. 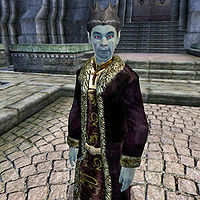 If you return to Chorrol after two days have gone by, he will seek you out and offer you a job to retrieve a certain item; in the process informing you that the Jemane brothers' father was a guild thief. After the quest is initiated, Fathis will drink all day long from 9am to 9pm, causing the townsfolk to remark: "One of the Gray Fox's top bosses, they say. Spends all day drinking at the Oak and Crosier, but he's been asking questions about the Jemanes." At 9pm, he will get out of his chair, pick up some food and sit down again, eating until midnight. He then wanders around the inn all night long. He will offer his illegal bartering services at all times, provided you have fenced enough stolen goods and rank as Master Thief. Like most other fences he will try to remain as discreet as possible and will not offer you his services while traveling from one place to another. A number of bugs will prevent Fathis from bartering with you at specific times, specifically when he spends time in Dareloth's house between 7pm and 5am and when sleeping in Dul gro-Shug's house between 5am and 11am. Also, after you have completed Sins of the Father, it is impossible to barter with Fathis ever again. See the bugs section for details. Being a high-ranking fence and Thieves Guild operative is certainly lucrative, and Fathis enjoys an upper-class wardrobe: a black & burgundy outfit and a pair of gold trimmed shoes. He also possesses a green silk garment which he never wears. He carries his house key as well as a small amount of gold. In combat he relies on a steel dagger. If you choose to give him the Honorblade of Chorrol during the related quest, he will keep it on his person henceforth. If you approach Fathis before having joined the Guild, he will politely introduce himself and never even mention his services or his connections with the Thieves Guild: "Fathis Ules. I've got a nice house. I have a little income... quite comfortable. Time is light on my hands." When asked about the Imperial City, he will reply: "It is a beautiful city. I love to walk, talk with everyone, hear the news, share the little stories of the day." After you have joined the Guild, his greeting will change considerably: "Ah, yes. A guild brother in search of a fence?" He will, however reject you his bartering services if you do not have the rank he desires: "My services are not for such as you. Go peddle your paltry wares to Ongar in Bruma, or one of the other lesser fences." When you start bartering with him, Fathis will announce "I am eager to peruse your haul. ", and then occasionally ask himself "Why must I be such a soft touch?" after a transaction. He will also remind you, "Don't forget, only I can fence the most difficult items." Fathis should have slept at The Oak and Crosier between midnight and 9am while Sins of the Father is active, but because no beds are available, he ends up wandering around the taproom all night long. Fathis sleeps in Dul gro-Shug's house due to a design flaw. He clearly should have been marked to sleep in his own house, but Dul gro-Shug's house is right above it in the Construction Set and the wrong cell was chosen. This mistake will make life much harder for Fathis; he doesn't have the key to Dul's house, and will have to wait from 5am to 6am in front of the door until Dul unlocks it. When he is finally inside the house, Fathis will end up waiting outside the locked Private Quarters instead of sleeping. Also, in the evenings, depending on how you use the fast-travel and wait features, Fathis can often be found locked inside Dul's house. This is due to the logic used by the game engine which ignores locked doors in some instances and places him in Dul's house with no way to get out. Unlocking the door to Dul gro-shug's house will allow Fathis to leave as scripted. Fathis will not offer his services inside Dareloth's house because he's leashed to the upstairs door (with a range that easily covers the entire house). After Sins of the Father is completed, Fathis stays in Chorrol for the rest of the game due to a poorly-designed AI schedule that prioritizes staying in Chorrol even after the quest has finished. Whichever option you choose to finish Sins of the Father, once the quest is completed you will be unable to barter with Fathis. There are a number of bugs in Fathis' schedule, leading to him only offering services at the times listed above. This issue has been addressed by the Unofficial Oblivion Patch; he offers service 24 hours a day.